VietNamNet Bridge – Viet Nam U23s thrashed Myanmar U23s 5-0 in the opening match of the Viet Nam Football Federation-Eximbank Cup yesterday, Oct 19, at Ha Noi's My Dinh National Stadium. Captain Pham Thanh Luong and midfielder Hoang Thien each scored a brace while defender Ngoc Anh helped himself to a rare goal as Viet Nam got off to a winning start. Playing in front of noisy home fans, Viet Nam dominated from the whistle, but they didn't open the scoring until the 32nd minute when Nguyen Van Quyet broke from the right wing before feeding the ball into Thien who fired home. It was 2-0 to the hosts just five minutes later when Thien picked up a rebound off a Myanmar defender before beating the Myanmar goalie for the second time. Captain Luong was proving a nightmare for Myanmar with his pace and skill, and he was rewarded with a penalty after he was brought down in the box. Defender Ngoc Anh stepped up to convert the spot-kick in the dying seconds of the first half to make it 3-0. Coach Falko Goetz made several changes at half time with the game already safe. Nguyen Trong Hoang and Dinh Tung joined Luong and Quyet to provide Viet Nam with a variety of attacking options. Hoang and Tung immediately proved their worth, combining to set up Luong in the 49th and then 88th minutes. Myanmar striker Min Thu had the ball in the back of the net but it was disallowed for offside. 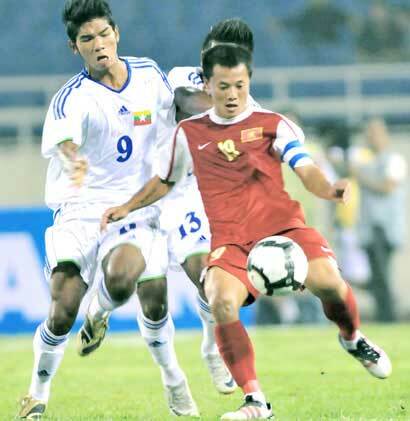 Viet Nam will meet Uzbekistan tomorrow who defeated Malaysia 3-1 in the earlier match. Myanmar are to play defending SEA Games champions Malaysia. The VFF Cup is an annual tournament that receives close regional attention. Viet Nam, Malaysia and Myanmar are all using this tournament to prepare for the upcoming 26th SEA Games next month in Indonesia, while Uzbekistan have tough Olympic qualifiers ahead. The winners of the VFF Cup 2011 will receive US$25,000 while the runners-up will earn $10,000 and $5,000, respectively.